As for the online pass, total fail. It means that as time passes it'll be harder than it would otherwise have been to find other players online (particularly in Australia). And it's obnoxious, because it means my wife can't play it online if she now decides she wants to without us paying Sony another ten bucks for the "privilege". Online passes are an awful idea. Once I've bought that copy of your game, I have every right to onsell the whole damn thing. Why should you get to take cuts out of it? I didn't even think about the future status of multiplayer in regards to pay walls. That's a very good point. I should add I just started playing 'Assassin's Creed Revelations' and found they also have a pay wall. However, much more friendly at least, they offer a three day trial for players to at least give a taste of the multiplayer. It's not perfect, but that makes much more sense to me. Some really insightful observations and a lot to think about. Good show, as is frequently the case. With regards to the combat have either of you heard the reports coming from NeoGAF and other source sregarding the changes made to the aiming and camera movement in Uncharted 3? For my part I distinctly felt a much more noticeable deadzone than I usually do when using the PS3 controller. From some of the comments made I suspect the answer is no, but have either of you played No One Lives Forever, or the original Jedi Knight? 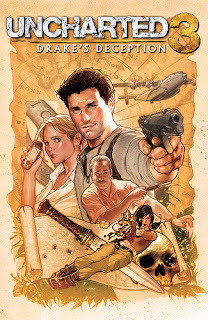 I ask because those games featured a number of set pieces that, though inherently of a lower graphical fidelity, are in some ways on par with those in the Uncharted series. Two examples specifically come to mind, a sinking boat that you have to escape in No One Lives Forever, and a spaceship that has lost gravity in Jedi Knight. Having played them previously I was actually underwhelmed by the similar scenes in Uncharted 3. When everything works as intended it creates an incredibly impressive scenario, but it's an illusion that is all to easily shattered. Those other games never relied as heavily on maintaining control so the parts where the scripting didn't work properly or the simulation faulted didn't feel as damaging. That's really a metaphor for the way I feel about Uncharted 3 overall, everything seems so precariously balanced that it only takes little glitch, one poor spawn placement, one out of place animation, to bring the entire ediface down. I agree that it was great to see Sully back but most of the character development between him and Drake seemed to occur during those flashback sequences, there were only very minor developments on it as the story progressed. They clearly wanted to be The Last Crusade, but that conflicted with certain gameplay concepts they wanted to explore, most of which required Drake to be on his own for large parts of the game. It was odd to hear Jorge say he always felt like he understood the motivations of the characters as I had quite a different experience. I was always clear on what was being done and the particular goal of Drake at every point but the motivation easily got muddled. I'm surprised to find myself saying it but I think Uncharted 3 needed a MacGuffin as there seemed only the most superficial of reasons for anybody beyond Drake to care about finding the lost city. Drake's own motivations as more personal, but as the player you are told that, we never get to feel that. The story hinges on a tension between desire and risk, but it's one that players never have to experience. There's never a point where Drake really has to make that decision, so nor do we. Regarding the demon enemies you encounter at the end, in some of those sequences the illusion Darke is experiencing starts to break down and you see that they are actually normal enemies and their demonic visage is simply how Drake is perceiving them in his hallucinogenic state. Part of the reason Elena's role is deminished is that the actress playing her had just had her TV series (Haven) renewed for a second season so she was available for less time than she had been during the prior games. A similar situation occurred with the actor playing Cutter (Graham McTavish) as he was cast in The Hobbit so had to leave for filming in New Zealand. Young Drake does possibly kill one of the people chasing him, albeit accidentally. Just before he is cornered on the roof Drake is grabbed and in the struggle he pushes his pursuer off the roof. We don't see what happens but the look on Drake's face suggests he does and it isn't pleasant. - As you imply, there's nothing new under the sun. The set pieces are similar to other games (Playing Super Mario Galaxy 1 and 2 made me pretty jaded in terms of level design), but I think it's Naughty Dog's (possibly foolhardy?) dedication to making them interactive is special. - Like you, I found myself losing the thread at certain points in the story. I think Sully actually made a joke about that very phenomenon, but it's the kind of joke that has more than a little truth behind it. - I had no idea about the logistical issues with Elena and Cutter's actors. It's really too bad that scheduling issues seem to be partly responsible for some missed opportunities. I suppose it makes sense though: a game this complicated, with this much dialog and acting requires a level of commitment on par with a TV show or film, two mediums plagued by scheduling conflicts!